The models and techniques of cognitive behavioral therapy are among the clinical psychology approaches that have been most successful, and well-known world wide. Firmly anchored to scientific research, they have been subjected to constant experimental verification, undergoing, over time, a constant evolution: from the first behaviorism, derived from studies on learning processes, up to the modern approaches of the so-called «third generation», characterized by interventions based on mindfulness and attentive to metacognitive processes rather than cognitive contents, and more oriented towards the understanding and treatment of personality disorders. The aim of this book is to provide those who approach these methodologies for the first time with a comprehensive overview of all models, and the strategies that derive from them, with particular attention to the implications of application and a wide range of practical examples. 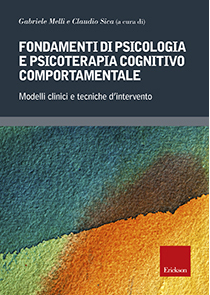 An indispensable text for university or specializing students, it is also useful for therapists trained in other psychological areas or more generally for all those who intend to get involved in this discipline.